PR Newswire 1.5 ounces of almonds daily also improved participants' intake of vitamin E and monounsaturated fat. Snacking has become nearly universal behavior in the United States, with an estimated 97% of Americans consuming at least one snack per day. [ii] In light of increasing snacking frequency[ii] and snack size[iii] among U.S. adults, combined with continued increases in obesity rates and widespread nutrient shortfalls, it becomes increasingly important to identify snacks that pose little risk for weight gain while providing health benefits. Snacking reportedly increases risk for weight gain, but this broad generalization may mask different responses to select foods. The newly published four-week randomized, controlled clinical study, led by researchers at Purdue University, investigated the effects of almond snacking on weight and appetite. The study included 137 adult participants at increased risk for type 2 diabetes. Participants were divided into five groups: a control group that avoided all nuts and seeds, a breakfast meal group and lunch meal group that ate 1.5 ounces of almonds each with their daily breakfast or lunch, and a morning snack group and afternoon snack group that each consumed 1.5 ounces of almonds between their customary meals. All almond snacks were eaten within approximately two hours after their last meal and two hours before their next meal. Participants were not given any other dietary instruction other than to follow their usual eating patterns and physical activity. Participant compliance to consuming almonds was monitored through self-reported dietary intake assessments and fasting vitamin E plasma levels. Despite consuming approximately 250 additional calories per day from almonds, participants did not increase the total number of calories they ate and drank over the course of the day or gain weight over the course of the four-week study. "This research suggests that almonds may be a good snack option, especially for those concerned about weight," says Richard Mattes, PhD, MPH, RD, distinguished professor of nutrition science at Purdue University and the study's principal investigator. "In this study, participants compensated for the additional calories provided by the almonds so daily energy intake did not rise and reported reduced hunger levels and desire to eat at subsequent meals, particularly when almonds were consumed as a snack." Almonds have also previously been shown to increase satiety in both normal weight[iv] and overweight subjects. [v] This may be attributed to almonds' monounsaturated fat (13 grams/ounce),[vi] protein (6 grams/ounce) and fiber (4 grams/ounce) content, but further research is needed to better understand the underlying mechanisms. Additionally, a recent study measuring digestibility found that whole almonds contain 20% fewer calories than the Nutrition Facts Panel states, suggesting that because of their rigid cell structure, not all calories are available for absorption. [vii] Further research is needed to better understand how this technique for calculating calories could potentially affect the calorie count of other foods. The new study suggests snacking can be a weight-wise strategy, depending upon the foods consumed. The combined positive effects of daily almond consumption seen in participants on hunger, appetite control, and vitamin E and monounsaturated fat intake without any impact on body weight suggests almonds are a smart snack choice that can help support a healthy weight. The Study: A study was conducted to determine the effect of almonds eaten at a meal or as a snack on blood sugar, appetite and body weight. To evaluate the measured effect, 137 otherwise healthy adults at increased risk of type 2 diabetes were assigned randomly to one of five groups for four weeks: a control group that did not consume nuts or seeds during the study period, and two meal groups and two snack groups that consumed 43 grams, or 1.5 oz. of whole almonds daily at assigned breakfast or lunch meal times, or morning or afternoon snack times, respectively. Oral glucose tolerance tests (OGTT) were performed at baseline, along with height, weight, body fat, waist circumference and blood pressure measurements. A 24-hour dietary recall was completed with a registered dietitian and "hunger', "fullness" and "desire to eat" sensations were captured using visual analog scales. Acute feeding sessions involving an overnight fast and consecutive blood samplings after ingestion of meals or snacks were performed one week after the OGTT and at the end of the four weeks. Participants underwent weekly follow-up visits where weight was recorded, 24-hour dietary intake and appetite sensation ratings were assessed. 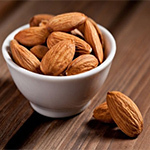 Results: Monounsaturated fat and vitamin E intake were significantly increased in all almond groups compared to baseline and the control group. Daylong ratings of hunger and desire to eat were significantly reduced in the combined (mid-morning + mid-afternoon) snack groups and the combined (breakfast + lunch) meal groups relative to the control group, with the most pronounced reductions observed when almonds were consumed as a snack. Despite the consumption of 250 calories from the 1.5 ounce serving of almonds daily, body weight did not increase among participants, which researchers suggest may be due to energy compensation in the diet and through inefficient energy absorption. Conclusion: This study provides evidence that 1.5 ounces of almonds, when consumed daily as a snack or with a meal, suppressed hunger and helped participants meet the recommended dietary intake of vitamin E all without affecting body weight. These findings suggest almonds may be a satisfying snack option to help maintain a healthy weight. Limitations: The study was short in duration and did not measure the long-term impact of consuming almonds as a snack. The measures of hunger, desire to eat and fullness are subjective measures with uncertain effects on actual calorie or nutrient intake. [ii] US Department of Agriculture. What we eat in America, 2011. [iii] Piernas C, Popkin BM. Snacking increased among U.S. adults between 1977 and 2006. J Nutr 2010; 140:325-332. [v] Mori AM, Considine RV, Mattes RD. Acute and second-meal effects of almond form in impaired glucose tolerant adults: a randomized crossover trial. Nutr Metab 2011; (Lond) 8(1):6. [vi] U.S. Dietary Guidelines recommend that the majority of your fat intake be unsaturated. One serving of almonds (28g) has 13g of unsaturated fat and only 1g of saturated fat. Scientific evidence suggests, but does not prove, that eating 1.5 oz of most nuts, such as almonds, as part of a diet low in saturated fat and cholesterol may reduce the risk of heart disease. [vii] Novotny JA, Gebauer SK, Baer DJ. Discrepancy between the Atwater factor predicted and empirically measured energy values of almonds in human diets. American Journal of Clinical Nutrition. 2012; 96(2):296-301.